ELAN introduces a series of high-performance luxurious yachts with the GRAN TURISMO ("GT") series. Elan Marine sets new standards in fast cruising yachts segment with the launch of the new Elan GT5 this autumn. The entire GT range will offer a top yachting lifestyle, based on Elan’s performance hulls, with a large and comfortable cockpit, designed for ultimate relaxation and easy sailing. “After many years of study and design, we are proud to announce the beginning of a new concept in yacht design. The GT series combines the best design and construction techniques from Elan’s award-winning performance yachts, while adopting the advantages of larger yachts. The GT range is truly unique in the market in terms of design, performance, safety and comfort” commented Chief Designer at Elan, Igor Zupan. The launch of the new GT series begins with the 40-foot GT5, which is based on Elan’s latest model in their performance range, S5. 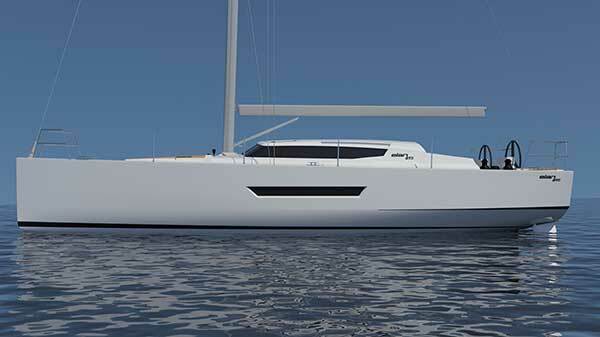 The first yacht of this new generation will set sail this autumn. The GT5 is designed with a short-handed crew in mind, making it easy for a crew of two to handle the yacht easily. The halyards and sheeting are controlled from the helmsman’s position, which keeps the cockpit clean of all lines, ensuring the utmost in comfort and safety on-board. With a bathing platform, options of a cockpit galley featuring a fridge, grill and other amenities common on much larger yachts, the GT5 cockpit is designed for enjoying time with family and friends, offering an ample seating area and different innovative cockpit table options. A clean deck design ensures fast and safe passage forward, and enables plenty of sunbathing area with dedicated cushions on the foredeck. The space below deck is unique in her class. The Elan Design Team has implemented an inverted saloon layout featuring the galley forward, ensuring optimal utilisation of the yacht’s volume for the most comfortable and innovative saloon in her size range. The galley forward offers ample storage space with a customizable corner to be equipped individually for each owner. The raised deck saloon ensures a bright and spacious living space with plenty of ventilation and more than 2 m of headroom. The GT5 is available with a two or three cabin interior layout and a single head featuring a separate shower compartment, and the option of a second head forward, making the owner’s cabin on-suite. Elan Yachts are considered to be the most competitive yachts available on the market today. Inspired by Humphreys Yacht Design’s superior sailing machines, the “VOLVO OCEAN RACE” yachts, Elan has inherited many of the features of these top competitive vessels, such as twin rudders, a high-performance T-shaped keel, chined hull ensuring the least amount of drag, and the latest vacuum infusion technology which makes every Elan yacht the ultimate sailing experience.